The SmX Pro-Line Frame is our world class designed projection screen frame. 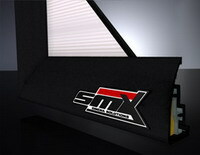 This is what makes the SmX Pro-Line Frame rise above the competition. When we began designing the SmX Pro-Line projection screen frame, we knew we had to break the box. We first sat down and studied all of our competitors projection screen frames to see how we can improve upon their design. We worked hand in hand with award winning extruding engineers to design the stiffest and strongest, yet lightest frame by using special extruding strengthening techniques. The SmX Pro-Line frames are constructed with the highest quality 6063 T-6 heat tempered alloy. Our frame walls are .092" (3/32") thick, thats one third thicker than the highest priced competitors using .062" thick standard grade aluminum. Our methods assure the SmX Pro-Line frame has a lifetime of use with no warping, flexing, bending, oxidization or corrosion. What does all this mean to the end user? It means never ending quality and reliability. It also means the ability to get wider one piece frames with no warping and no deflection causing waves or creases in your projection screen material. These engineering methods also assure you a precisely straight, squared frame for life. We did extensive testing against our competitors black trim and came up with a trim material that is by far superior to all. The competition uses a cheap black flocking trim that reflects light back at the audience. The SmX Pro-Line frame uses the finest quality, blackest of black, light absorbing true velvet that absorbs all the light. There is nothing available on the market that is blacker than our velvet. Other "so called" Black Hole velvets look grey in comparison to ours.